The search and rescue efforts in Nepal following the devastating earthquake last weekend has been all hands — and paws — on deck. 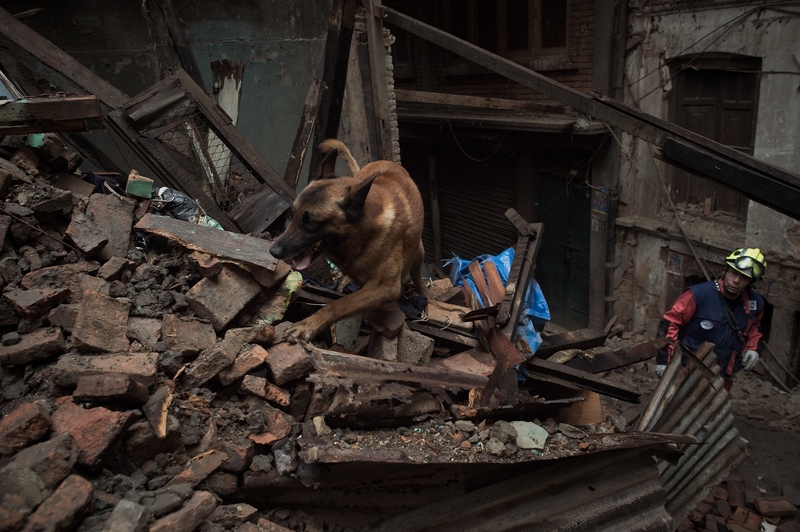 As workers pour into the destroyed area from all over the world to assist in rescuing people trapped under the rubble and bringing food and other supplies to the victims, dogs are helping save lives in Nepal by smelling for a human scent under the debris. On Thursday, a teenage boy was pulled out of the wreckage from a collapsed seven-story building in Kathmandu after a U.S. search dog alerted rescue workers to the boy. Pemba Tamang, 18, was carried out on a stretcher after Nepalese and American rescue teams worked for hours to free him from the concrete slabs he was trapped under. The dog who initially found Tamang, is from a California nonprofit called Search Dog Foundation, which trains rescued dogs to find people buried alive after disasters, and sent a team of six dogs and their handlers to Nepal. After Tamang's rescue, the Search Dog Foundation said on Facebook: "Tears of joy here at SDF as we receive word that a U.S. search dog has alerted and rescuers have pulled a teenage boy from the rubble of the ‪#‎NepalEarthquake‬. He is now being treated at the hospital. Incredible." According to Nepal's National Emergency Operation Center, the death toll of the 7.8 magnitude quake reached nearly 5,700 Thursday and the number injured climbed to roughly 11,500. Dogs, as part of rescue teams from across the world, are helping sniff out victims who are still alive, but trapped under debris and out of sight. The Search Dog Foundation posted on Facebook: "Thank you to the men, women and canines working around the clock to save lives - 'dog-speed' on your mission in ‪#‎Nepal‬." The Search Dog Foundation's Nepal team includes six dogs — Rugby, Tanker, Riley, Pearl, Stetson, and Ripley — of which four were rescued from shelters. According to the Search Dog Foundation's website, each dog went through six months of training where they learned disaster search skills and bonded with their handler. Teams from the U.K., Spain, France, India, and Japan also brought trained dogs to the affected area to help find people in the aftermath of the earthquake and based on the success story of Tamang, the canines are saving lives. As recovery efforts continue, the death toll in Nepal is expected to continue rising, but there are still some survivors being found and saved.